KATY, Texas — A Texas teen says that her teacher told students this week that they must deny God in their reading class or fail the assignment. 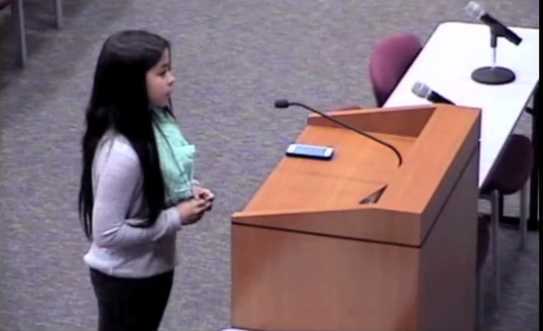 Jordan Wooley, a seventh grade student at West Memorial Junior High School in Katy, spoke before the school board Monday night to tell her story. Wooley said that a number of students objected to her teacher’s assertions that God was a myth, but the teacher would not have it. Wooley explained that one of her friends, who went home crying, wrote on her paper that God was fact, but her answer was marked as being incorrect. “She turned in her paper, and she had still put that God was a fact and to be true, and my teacher crossed the answer out several times to tell her it was completely wrong,” she said. “Another child in my class asked the teacher if we could try to put what we believe in the paper, and she said you can if you want to get the problem wrong … [but] you’ll fail the paper if you do,” Wooley told the board. She explained that she believed how the teacher handled the matter was wrong. The Katy Independent School District has now released a statement about the matter, advising that two students had contacted the principal about the matter, resulting in an investigation. The district remarked that the teacher herself is a Christian, and that the assignment has been misunderstood. However, it advised that the lesson has been scrapped and noted that action will be taken in the matter. “The school regrets any misconceptions that may have resulted from this teacher-developed classroom activity and assures its school community that the religious beliefs of all students and staff are welcomed and valued at Memorial Junior High,” the district said.